Well actually it isn’t that evil. 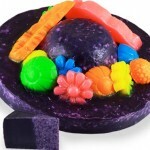 It’s some new Lush products which have been released to celebrate el Día de los Muertos – The Day of the Dead! This beautiful and colourful festival running from October 31st to November 2nd, has long since been a Mexican tradition which celebrates the lives of those who have passed on, allowing the living to remember them in their own way. This fantastical celebration of the spirits who have left us encompasses dancing skeletons, bright costumes, an explosion of marigolds and of course a tequila or two. In an exciting cultural twist Lush have chosen to focus what would usually be their ‘traditional’ halloween specials (think pumpkin shaped bath bombs and ghostly white shower gel) on this Mexican holiday which focusses on celebrating life. In Mexican folk culture, the Catrina is the skeleton of a high society woman and is one of the most popular figures of the Day of the Dead celebrations. Shaped like hat and adorned with colourful flowers, Lady Catrina halloween hand and body soap pays homage to the dress code of the Mexican’s favourite spooky lady, offering a zesty Mexican fragrance of fruit pastilles and freshly cut limes which has enough kick to wake the living dead. Organic agave nectar and its key ingredients fructose and glucose offer a super soothing and softening vegan alternative to honey and the soap lathers nicely to tone and moisturise the body in lush’s spookiest shower experience yet. Calavera (meaning ‘skull’ in Spanish) is a bath ballistic with a fresh lime and citrus fragrance. The ballistic is packed full to the brim with Mexican marigold petals and an array of colours which will transform your bath. 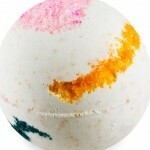 For more products and information please visit the Lush site here.